The Internet is all abuzz, aflutter and atwitter lately about Netflix’s recent decisions to raise prices and split its well-known DVD-mail service off into a new service called Qwikster. I’m not immune to the hype, and since my last Netflix charge came in at over $25, I've been wondering if I should keep the service or not. 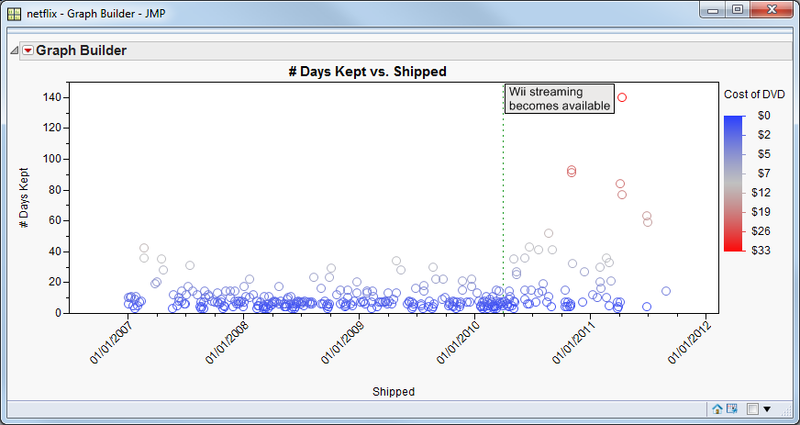 JMP should be able to help me analyze and visualize my data. I currently am a subscriber to both the DVD-mailing service (3-at-a-time) and the Web streaming service. I started as a 2-DVDs-at-a-time Netflix subscriber at the beginning of 2007 after someone bought me a gift subscription. I loved that so much that I eventually upgraded my plan to 3-DVDs-at-a-time. Later, the Web streaming became available through my Nintendo Wii, and I started to take advantage of that service more and more, while my DVDs have been sitting idler and idler on the coffee table. For more than one reason, I need to re-evaluate my usage. Netflix makes your entire rental history available online, and I want to import this into JMP. Sadly, a direct copy-and-paste from my Web browser to JMP did not work, but using Microsoft Excel as an intermediary works like a charm. Use Get External Data->From Web on the Data ribbon menu. Next, I can copy-and-paste from Excel to JMP, which transfers all the data to my JMP data table -- although you can see it needs to be cleaned up as there are a bunch of empty rows. 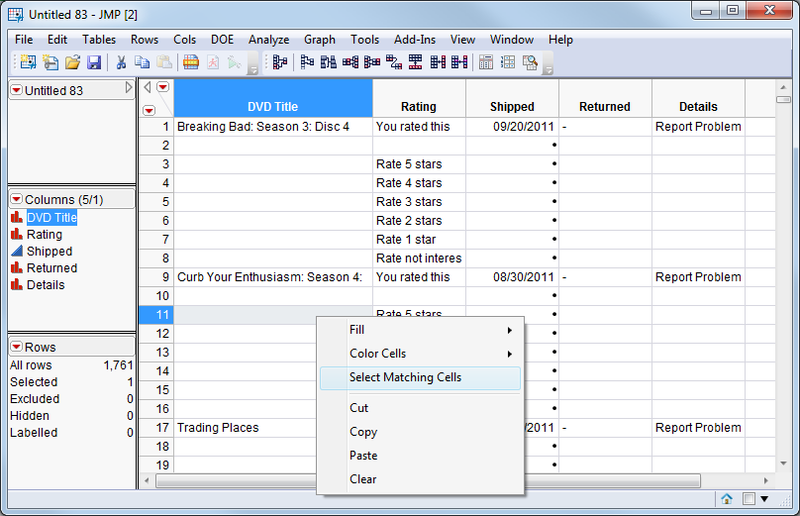 I can clean this up by selecting one of the empty cells in the DVD Title column, then right-clicking to choose Select Matching Cells. I can now delete all the empty rows. Delete the columns for Rating and Details; I won’t use them. Delete the rows where DVDs were reported missing. 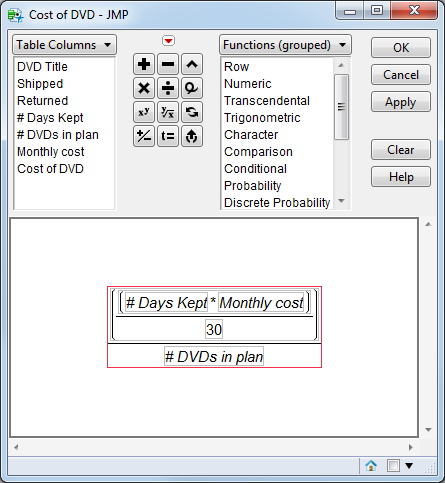 The Returned column was imported into JMP as character because of the dash character used for missing data. I need to change the data type to Numeric and format it to show the dates properly. JMP can do this in a few clicks. Look up how many DVDs I had in my plan at a given time. I started at 2-at-a-time and upgraded to 3-at-a-time in February 2010. I created a column # DVDs in plan to track this. Go back through my rental history and find out how much Netflix charged me per month. I was able to find this information after five minutes of searching through credit card statements. I created a column for this named Monthly Cost. A particularly noticeable trend is that the time I have kept DVDs has increased dramatically since Web streaming became available via the Wii. I admit I have used and enjoyed that feature a lot, watching all sorts of documentaries and nature shows that would never have made it into the DVD queue. It is clear that my DVD usage has decreased and my cost per DVD has increased. I should reduce the number of DVDs I have out at one time, or perhaps cancel altogether. While I was writing this post, I noticed that Chris Hemedinger, author of The SAS Dummy, has beaten me to the punch and already written a post about a similar analysis using SAS. I encourage you to read his post; I’m sure glad I did. Chris used SAS Enterprise Guide to come up with a model for movie cost and eventually created a Time Series graph. 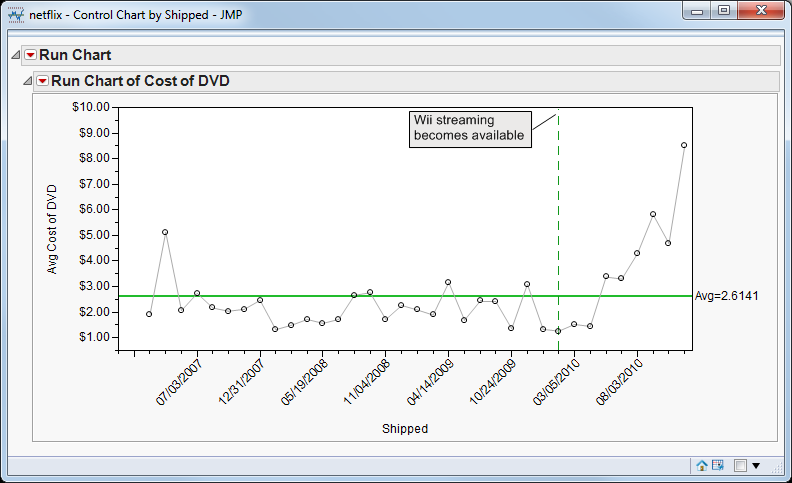 Chris' graph is the inspiration for my next plot, which uses JMP’s Control Chart Platform to group each set of 10 DVDs together and calculates a moving average. What I’m essentially plotting in this control chart is my DVD-rental process. My moving average over nearly a four-year period is $2.61 per DVD, which is pretty darn good in my opinion. However, in the last year, my process has gone out of control, and JMP is telling me a change needs to be made. My conclusion is that I will cut back to 1-DVD-at-a-time while ($8 per month) using Qwikster, while still enjoying the Netflix Web streaming service using my Wii (also $8 per month). This will reduce my recurring monthly fee by about $9. I’ll probably need to redo this analysis in another year to see if I’m really using the DVD-by-mail service enough to justify it.